Searching for a Teaching Job? Preparing for a Teaching Interview? This book can help! 2010 Edition Now in Paperback from Amazon.com! At last, you're finally done with college and you've got your teaching degree in-hand. You have completed your student teaching and, maybe you've even been a substitute teacher or teacher's assistant. But now is the time for you to begin your career as a full-time teacher. I Want a Teaching Job: Guide to Getting a Teaching Job is a paperback book that can help you through the job-hunting process. I am a full-time, veteran teacher who has been on countless teacher interview committees. I want you to succeed in your job search. I wrote Guide to Getting a Teaching Job to help make your search for a teaching job easier. The book was designed to prepare you for every stage of the job hunting process, from writing effective resumes and cover letters to building a teaching portfolio to marketing your teaching skills at interviews. You've submitted all of the necessary paperwork to the human resources office of several school districts, but you're not getting invited to any interviews. Why not? Find out on page 15 and 73 of the book. You're asked the toughest interview question of all: What are your weaknesses? How do you answer this question without seeming like an ineffective teacher? Discover the answer on page 40. The principal ends your interviewer by saying, "Do you have any questions for us?" What types of questions can you ask? Learn how to develop appropriate, thoughtful questions on page 63 of the book. What do you do if you're invited back to teach a sample lesson in front of real students? Find out how to prepare on pages 47 and 48. How can you make yourself seem more experienced (without stretching the truth)? Page 43 has your answer! Where do most candidates go wrong in creating their teaching portfolios? Page 39 has common portfolio blunders! What education jargon should you recognize and be able to use? Learn to "talk the talk" on pages 69 and 70. How do interviewers decide which teachers are a good for their school? Read the "interview with a teacher interviewer" on page 88.
search for a teaching job! I just wanted to thank you for your positive advice. I ended up getting a job in a wonderful school whose philosophy reflects my own. I'm not sure if I would have gotten the position if it weren't for your positive advice ... Again, I appreciate all of your help! Thank you so much for recommending that ebook (Guide to Getting a Teaching Job). The interview questions and answers were awesome and I've been looking for this book for a long time. I would just like to thank you for the ebook you wrote!! I always imagined my first interview being a total disaster, but it went great! I didn't feel nervous at all when I got in there because I felt so prepared! Michigan's teacher job market is awful right now and I when I saw there was an opening at an amazing district, I was so excited! That's when I found your book and started studying! I ended up getting my dream job! (and on my first try....thanks to you! )....Thank you so much again!! I really recommend that anyone who is going to interview should get this ASAP! It's definitely worth the $20 for a job in the end! I thoroughly enjoyed your book. It is very informative and full of great advice. I especially liked the interviews with other teachers at the end of the book. Great information! . . . Again, I enjoyed your ebook very much and have been using it when putting my resume together and my "flash cards" of interview questions. I have recommended your website to some student teacher friends and will continue to do so as I have found it to be very worthwhile. Thanks for writing such a useful handbook!!! I am finding it an invaluable resource in my search for a teaching position. It is insightful, succinct, and easy to use. I will refer back to it often. I Want a Teaching Job is available through Amazon.com, a respected and trusted Internet retailler. The messages above are real and unsolicited. See our Fan Mail Page on iwantateachingjob.com for more testimonials! 2010 edition now available! Order safely and securely through Amazon.com. A paperback copy of this book can be sent to your home within a few short days. There's also an eBook version available - download a pdf of this book instantly. Visit our companion site, iwantateachingjob.com, for complete information. Article - Do I REALLY need a Teaching Portfolio? Article - Why Can't I Find a Teaching Job in Michigan, New York, New Jersey, or Pennsylvania? 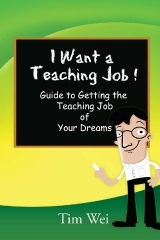 You can purchase a paperback copy of I Want a Teaching Job at Amazon.com.